To celebrate the impending release of Amonkhet, I thought it’d be fun to put our brewing caps on this week. I’ll get back to metagame/decklist analysis soon, I’m sure, but recently I’ve been taking a look through the Amonkhet spoiler in the hopes of finding something that tickles my interest. Overall, I haven’t been that enthused. From the looks of things, Amonkhet doesn’t have much to offer in terms of “non-combo” options. I’ve heard that As Foretold will bring with it some possible changes, but at this point in Modern’s development it’s difficult to make waves with new cards unless mechanics are involved. Delve as a mechanic was beyond busted, which is why we saw so many Khans cards cross the barrier. Having to fight fair against Terminate and Tarmogoyf is not impossible, but still incredibly difficult. Seeing as we just got Fatal Push, I wouldn’t be surprised if fair decks were left out in the cold for the foreseeable future. Still, I can’t bring myself to be disappointed 269 times in a row, so this week I forced myself to take a few new cards and put them through the ringer myself to see if they work. It’s important to note that my expectations going in are not to come out the other end with a tournament-worthy deck, but I still intend on trying my hardest. While the end result might be considered a “failure,” if through the process we learn something about the format or our own biases, we can at least point to that as a positive. That being said, I give you: Planeswalker Control! The idea is simple enough: play enough planeswalkers that require attention that our opponent can’t devote enough resources to killing them all, thereby preserving our life total and getting us there via some ultimate. Gideon of the Trials can’t be ignored; with his emblem our opponent has to deal with him. His +1 locks down a permanent, so at worst he protects himself, and in combination with Jace, Vryn’s Prodigy we can handle most boards. How we’re winning isn’t really an issue—as long as our walkers hit the field and we’re ticking up on our turns, we’ll be fine. I’ve also included the Saheeli Rai/Felidar Guardian combo, as the scry helps get us to whatever we might need, and Felidar Guardian can reset planeswalker loyalty or just net us another activation. Still, those six slots could easily be spent on something else, like more Nahiris and an Emrakul, the Aeons Torn, for instance. We’re not RW Control, so it makes sense to talk a little bit about identity. Stretching into red for Nahiri and Saheeli (mainly Nahiri) necessitates some help as far as mana as concerned, which is where Birds of Paradise and Oath of Nissa come in. Oath is deceptively strong, as it fixes mana and is definitely our green Ponder, but by playing these spells we resign ourselves to being behind on-board and weak to discard. Sixteen planeswalkers is a ton, however, so as long as we’re alive I doubt we’re having trouble casting spells. Tarmogoyf is in here as a blocker, sure, but it can turn the corner with Gideon of the Trials in a heartbeat. The fact that we’re not playing him alongside sorceries like Traverse the Ulvenwald or Thoughtseize means we’re relying on our opponent to help him along. He’s not as great as he could be, which I suppose I could say for most of the cards in the deck (which I again suppose means the deck is probably poor). One last note before moving on: with Nissa, Steward of Elements, we’ve got a lot of scry, as well as ways to buy time to get us to what we need. It’s difficult for opponents to deal 20 damage through a ballooning Jace, Vryn’s Prodigy or Gideon of the Trials. Most non-Death’s Shadow decks rarely have more than five power on the board at one time, and factoring in removal and blockers, we can handle a fair amount of normal action in the combat phase. Unfortunately, that sort of normal action is rare in Modern. Affinity makes giant dudes or slaps Cranial Plating on Etched Champion. Dredge floods the board repeatedly or just Conflagrates us to death with Life from the Loam. Zoo hits us for 14 on turn three. Death’s Shadow attacks for 10 at a time. While we’re set up to handle some of that, trying to defend against all of it (while also giving up our game ones against combo) is very ambitious. On the other end of the spectrum is this, your classic, “take an established deck, shove four copies in, and call it a day,” decklist. Sure, I moved a few numbers around here and there, but I’m not even trying to hide that this is taken directly from the winning GP San Antonio list, which is a month old now. So why include it? Partly, it’s a critique on the notion that adding a shiny new card to an established list is more involved than just throwing it in, but also because underneath that, I do believe there is something here. Gideon of the Trials paired with Leyline of Sanctity protects him from direct damage, meaning as long as we can protect him on the ground, we’ve essentially put our opponent in a soft-lock. Yes, Abrupt Decay, Maelstrom Pulse, and Detention Sphere can knock him out, but those cards see minor play so I’m not too worried. At worst, they get rid of our Gideon (either through a spell or attacking directly) and we gained a bit of life and/or made our opponent spend mana on something other than killing us directly. The positives, of course, are numerous. Gideon locks down creatures until we can hard-answer them, and he starts swinging earlier than before (Celestial Colonnade doesn’t come online until turn six, and even then we’re putting our guard down to hit for four). He also helps our combo matchups tremendously, as Ad Nauseam needs to change something to handle this guy. The fact that Gideon costs three, can protect himself, can do damage as a Plan B, and can emblem to turn our opponent’s plans upside down (or go over them entirely) is well worth the three-mana investment. Still, if I’m playing Gideon of the Trials as a central component of my strategy, I would be much happier if I had some bodies to throw in front of attackers past the first. Lingering Souls immediately jumps to mind, but isn’t entirely necessary. Removal and Snapcaster Mage are just enough to get our opponent to overcommit into a Supreme Verdict, which is really all we need to put the game away anyways. This list, in my mind, is much closer to a dedicated Gideon of the Trials control list than the other. While that list contained stronger cards in the abstract (i.e. Ancestral Vision), this one focuses much more on synergy, while boasting the ability to turn the corner at the expense of late-game longevity. Moving Spreading Seas to the board is fine so long as we retain access to it for games two and three, as game one we’re not expecting to “get” anyone with the card so much as just looking to buy time. Wall of Omens does the same thing by giving us a body on the ground to get in front of attackers. Again, our plan is to make opponents overcommit into Supreme Verdict. If they don’t play along, be it playing to the board or casting spells into Cryptic Command, Restoration Angel tags in to use some of that mana and present another body to attack or block. Turning the corner is less of a cliché and more of a legitimate threat when we can flash in Resto, turn on Gideon, animate Colonnade, and hit for 11. If we can sneak in at least one Gideon hit before then, we’re killing our opponent dead, assuming they fetched a few lands or played a Thoughtseize. The value that Gideon of the Trials gives a control strategy like this one can’t be stated enough. It bears repeating that Gideon has applications against both aggro and combo, represents a threat against control, provides a Plan B against all matchups, and generates a puzzle for our opponent to solve—all for three mana. Costing three means Gideon slides down on our early turns (where we’re really just looking to play anything we can) and forces opponents to overcommit into Supreme Verdict the next turn. I’m sitting here imagining if I would still be interested in the card were the ultimate a -10, and I believe the answer is yes. That alone should be enough evidence that we have something here. We abandoned Nissa, Steward of Elements pretty quickly, but I don’t think that’s anyone’s fault. I’m much more interested at this stage in seeing what Gideon of the Trials has to offer, and it doesn’t look like the two will go together in Modern at this point. 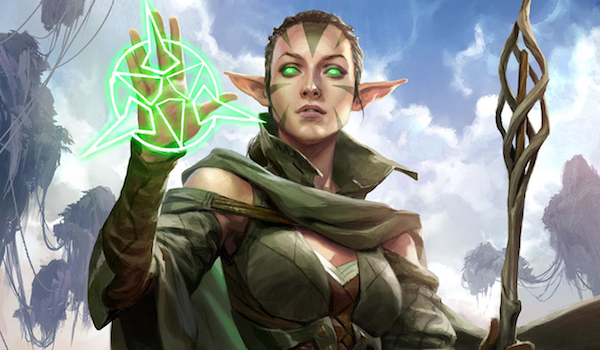 Nissa is much more interested in existing alongside creatures and big mana, while Gideon seems to play better with synergy. And, of course, the Bant deck of choice is Eldrazi. I’m sure there are applications for both cards outside of a control/midrange shell, but for now, on day one, that’s where I’m leaning. I know I’m among good company when it comes to Gideon of the Trials, but as for now, I’m believe my control list might have what it takes. Remember, if Gideon of the Trials breaks Modern, you heard it here first!